Could a Strong Dollar Provide an Opportunity for Owning Gold? Home » Could the strong dollar provide a great opportunity for owning gold? Could the strong dollar provide a great opportunity for owning gold? 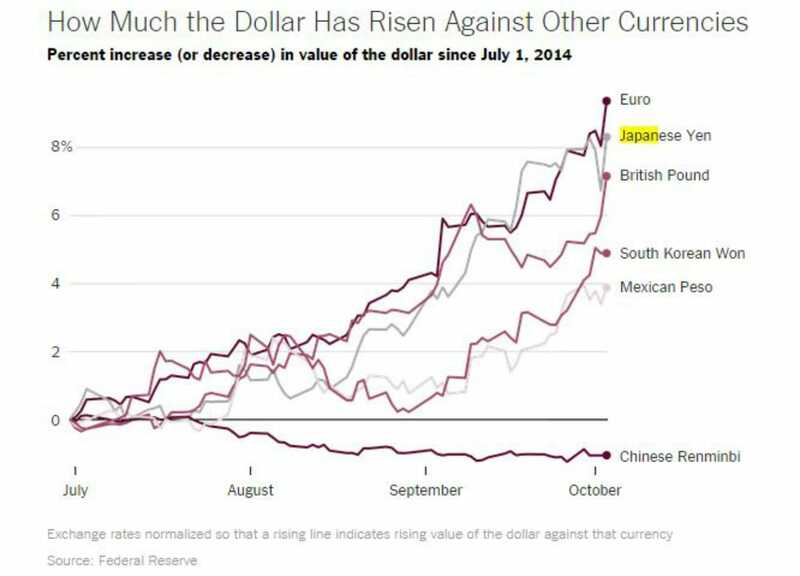 The dollar is rallying and gold seems undervalued. Is this an opportunity for gold buyers? What’s the reason behind the dollar’s rally? The Federal Reserve has started withdrawing its stimulus program while the European Central Bank and the Bank of Japan are expanding their efforts. The economic stimulus known as Quantitative Easing is effectively a “money printing” scheme which inevitably leads to the devaluation of one’s own currency. And here the dollar gets a double kick – a relief from the Fed and a boost from foreign banks taking down their currencies. The greenback’s rise also reflects confidence in the United States economy and concerns about the prospects elsewhere. The chart below illustrates this clearly. On Tuesday, the International Monetary Fund lowered its estimates for global growth this year to 3.3 percent from 3.7 percent, and also reduced its forecast for 2015 to 3.8 percent. Europe got some of the biggest reductions with only 0.3 percent expected growth for the Eurozone economy. 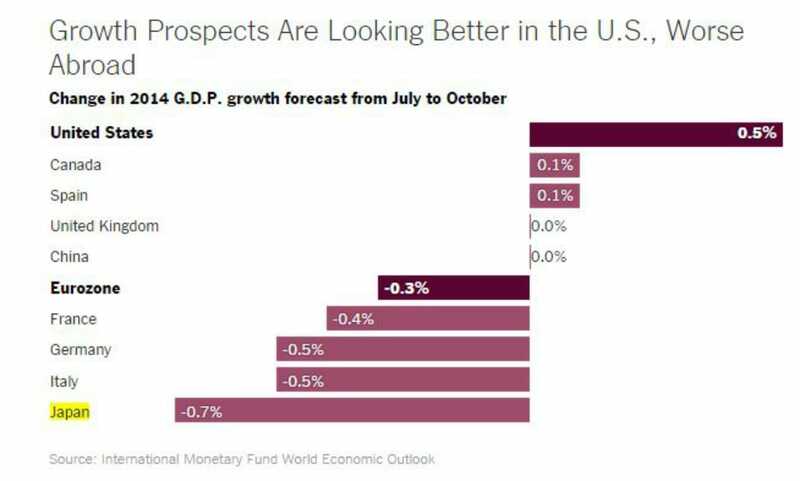 In contrast, the forecast for the United States is 0.5 percent. 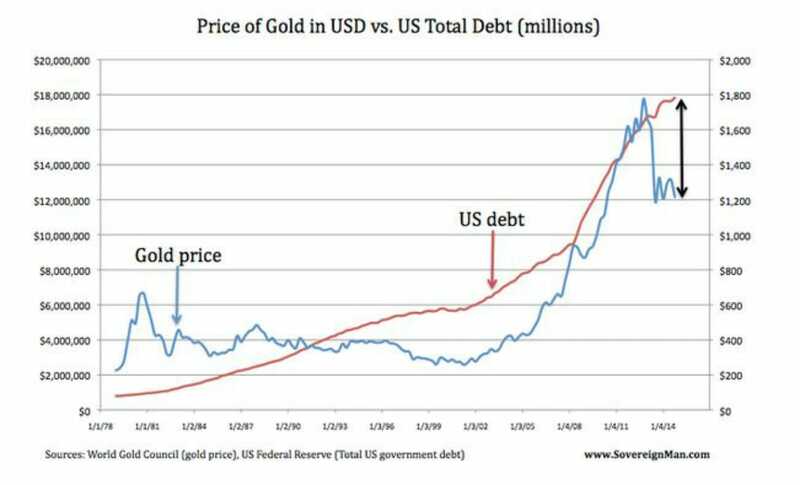 Tim Price, Director of Investment at PFP Wealth Management in the UK and frequent contributor for Sovereign Man, has discovered a chart from the World Gold Council that clearly illustrates two things: first, the strong correlation between the price of gold and the massive expansion of the U.S. debt, and second, how undervalued gold is at the moment. “And if one expects that relationship to resume (we do), then gold looks anomalously cheap relative to the rising level of US debt,” concludes Price. 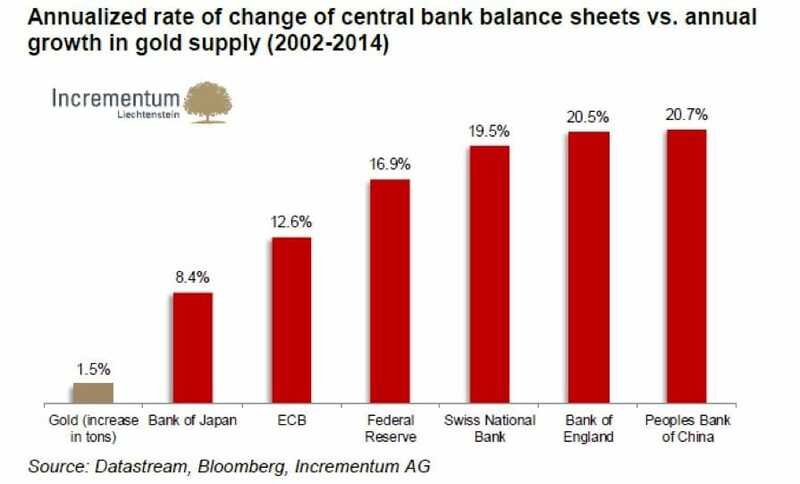 “A second rationale for holding gold,” he says, “takes into account the balance sheet expansion of central banks.” The chart below demonstrates the big difference in supply rates. Gold supply rises only at 1.5% a year while major currencies are being “printed” at rates higher than 20% a year. Gold, one of the oldest forms of currency, cannot be devaluated by sharp increases in supply, and thus, says asset management company Incrementum AG, is expected to rise against paper currencies. Are you too convinced that gold is greatly undervalued? If you are, perhaps you should consider exchanging some of your paper dollars for physical metals – and that’s before even considering concerns that we are in another stock bubble. Many public figures such as Ron Paul and Steve Forbes regard gold as insurance policy, and many investors say that gold reduces the overall risk in a portfolio. If you are considering the possibility of buying gold and other precious metals to insure your wealth against economic malpractice and geopolitical uncertainties, you can call our Precious Metal Specialists at (800) 355-2116. And don’t forget, you can always follow us on Twitter to stay up to date on the latest news about what’s going on in the markets.